Les Nouvelles Esthetiques, South Africa would like you invite all spas to participate in the 15th Annual South African Spa Awards, presented in association with Les Nouvelles Esthetiques & Spa, Paris. Spas are the source of finding a sense of well-being. They are a sanctuary where one can escape and a place to unwind. They allow us to renew our body, mind and soul, and although society generally has moved away from embracing recreational time, we are finally coming full circle and embracing this time to revive and de-stress. The phenomenal growth in the Spa Industry in South Africa is symbolic to this, thus the Les Nouvelles Esthetiques Sanitas Per Aquas (S.P.A) Awards was established in 2005 to honour this flourishing market and those who excel in their field. Now into its 15th year the awards the Les Nouvelles Esthetiques South African Spa Awards is the country’s premier spa awards and has grown from strength to strength, boasting the county’s finest spas as winners and finalists. These prestigious awards acknowledge excellence and those who set the benchmark, in quality and innovation within the Spa, Health & Wellness Industry. Through the success of the previous awards, the Les Nouvelles Esthetiques Spa Awards increases in its stature each year, providing the South African and International Spa Visitors and Media with a comprehensive choice of award winning spas, and a reliable source of spa information and recommendations, within South Africa. The awards have been designed to stimulate a desire for service excellence among South African Spas in a growing local and international market. 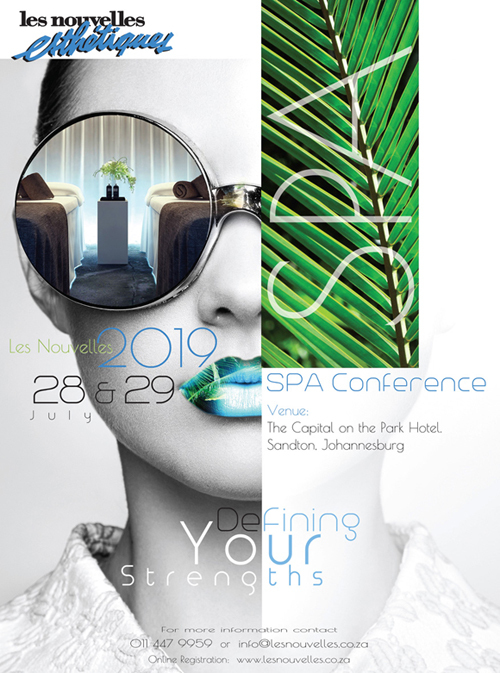 The annual Les Nouvelles Esthetiques Spa Awards will be hosted by Les Nouvelles Esthetiques South Africa in association with Les Nouvelles Esthetiques Paris, on Sunday the 28th July 2019, at The Capital on the Parks Hotel, Sandton Johannesburg. The Les Nouvelles Esthetiques Spa Awards are trustworthy and transparent and have become the Spa Awards of Choice throughout South Africa as they represent the true picture of the spa industry. The Les Nouvelles Esthetiques Spa Awards were the first spa awards to be introduced to South Africa and offers a focused and comprehensive line-up of spas categories, which encompasses all aspects of a spa, including quality of treatments, design, marketing, staff qualifications and training programs and the little extras that make the customer experience. Additionally the Les Nouvelles Esthetiques Spa Awards focuses on the people within the industry who have made an outstanding contribution to the industry in the past year, through the 4 recognition awards, namely, Spa Humanitarian, Spa Visionary, Spa Ambassador Awards and Spa Management Excellence Award. The Les Nouvelles Esthetiques Spa Awards are proud to celebrate the outstanding efforts of individuals and spas driving the exceptional standard of excellence of the South African Spa Industry. PR Exposure: The spa awards winners and finalists are featured in magazines, newspapers and websites nationally and internationally. International Recognition: Les Nouvelles Esthetiques Spa Awards is hosted in conjunction with Les Nouvelles Esthetiques, France, ensuring international exposure and recognition. Entry Process: Many entrants discover that one of the most rewarding aspects of entering an award is the process of sitting down, probably as a team, and thinking about what has happened and the reasons for the success. In many cases, this leads to further thoughts and future improvements. 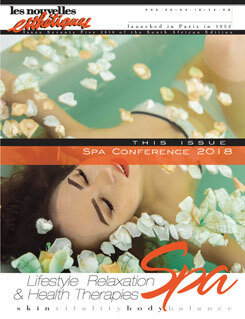 A small spa is as likely to win as a larger spa: Our judges review entries against a standard of excellence; entries do not compete against each other. Smaller spas with only a few employees demonstrating spa excellence and attention to detail are just as likely to win as a larger spa. Team Morale: Just by being acknowledged for an award is a tremendous boost for any individual or team. The Award Ceremony: The thrill of the awards ceremony is a moment that cannot be replaced, as winners and finalists are acknowledged by industry peers and media. Show the world you’re worth it: Through the impartial third-party recognition that the Spa Awards provide, you can show that your efforts are working and contributing to your spas overall goals. Impress and amaze your clients…and get some new ones too: Whether it’s maintaining current clients or winning new clients, the Les Nouvelles Esthetiques Spa Awards validates your superior work and gives your clients and new clients the confidence they need to visit your spa.